They are inside your laptop computer and your DVD player, present on the factory floor and the supermarket checkout line. 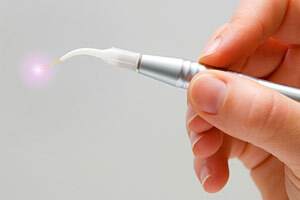 And now, lasers are finding increasing use in dentistry. Someday soon, you may have a routine dental procedure performed with the aid of a powerful, yet highly controllable beam of laser light, instead of a drill or a probe. What are dentists currently using lasers for? These devices have been proven to help in the detection and treatment of oral diseases. They can be used for treating gum disease, detecting cancer, and pinpointing tooth decay in its early stages. They can precisely remove tissue, seal painful ulcerations like canker sores, and even treat small cavities. In the future, dental laser technology will undoubtedly find even more applications. Lasers take advantage of the quantum behavior of electrons, tiny particles inside atoms. By stimulating atoms with pulses of energy, and then using a method of optical amplification, they cause the atoms to produce a beam of coherent light. Essentially, that means that they emit light which has a great deal of energy, yet can be precisely controlled. It's the combination of high energy and precision that make lasers so useful. Where Are Lasers Being Used? At present, the use of lasers in dentistry falls into three general categories: disease detection, soft tissue treatments, and hard tissue treatments. There are many ways lasers can aid in diagnosis. Laser light of specific wavelength, for example, can detect tiny pits and fissures in the biting surfaces of the tooth that a traditional dental tool can't find. This enables a defect that's too small to be treated at present to be carefully monitored. Lasers can also help locate dental calculus (tartar) beneath the surface of the gums, and can even aid in the detection of oral cancer in its early stages, accurately showing where healthy tissue ends and diseased tissue begins. For the treatment of soft tissue problems, lasers have many advantages. They are minimally invasive tools that generally involve taking away less tissue than conventional methods. Used in gum surgery, for example, lasers can treat gum disease by killing harmful bacteria deep in pockets below the gum line, and removing the diseased tissue without harming the healthy tissue. They can also remove the thin layer of cells that inhibits reattachment of the gum and bone tissues to the tooth, while sealing off the adjacent blood vessels. This type of procedure generally results in less bleeding and pain. Lasers are also effective in treating ulcers and sores on the lips or gums. Lasers are even finding increasing use for hard-tissue procedures, like the treatment of dental caries and cavities. Not only are they more exact in the amount of material they remove, but they eliminate the noise and vibration of the dental drill, which is uncomfortable for some patients. As lasers become more common in the dental office, these high-tech tools will be integrated into routine dental practice. This promising technology already offers some real benefits, and is sure to find increasing use in the near future.